Our family circa 1950. Don't you just love the style of dress? My family's dream of America began in the aftermath of World War I, during the rise and persecution of sociofascist Benito Mussolini. Unfortunately, the specter of newly-enacted U.S. immigration quotas forced la mia famiglia Pisani to first emigrate to Canada. After more than a year, however, my branch of the family entered the United States and ultimately settled in an upstate New York village. That was a special time, a momentous event for nonno Raffaello e nonna Viola. Although educated, my grandfather found few employment opportunities other than menial jobs, but he gladly worked them, as did his children to help out when they reached adolescence. 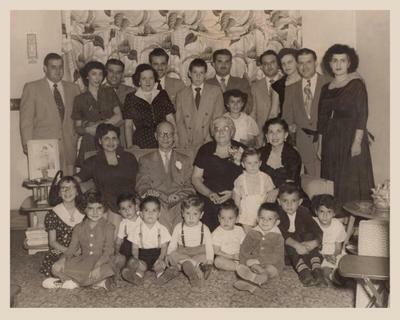 As the family's lot improved, so did nonno's English proficiency. He took a chance, borrowed some working capital, and developed a laundry and dry cleaning facility. Through hard work, honesty, and selfless commitment, the fledgling business soon prospered. My grandparents were inspired enough by the ideals of liberty and opportunity to leave all that was familiar behind, cross an ocean to an unsettled future, and literally risk everything. For the remainder of their lives, their gratitude for America was unbounded, and as such was infused in their children and grandchildren as well. I am happy to report that nearly all of their male progeny (and one female) proudly served in the U.S. armed forces, were (and remain) imbued with civic responsibility, and give thanks each day for the miracle that is the United States of America. Although family members now happily reside in nearly every state of the Union, our nonni's dream also remains alive through us. The attached photo shows our American Pisani family. Very impressive publication here. Moreover as I see, this question is very actual for many people indeed. Personally I totally agree with author opinion about this subject and I think that it would be really my profile interesting to create such discussion with other this website visitors. Anyway thanks a lot one more time for the great and informative publication. And I will definitely be waiting for more such nice posts like this one from you. Kind regards, Peter Rickson. Fine information, many thanks to the author. It is puzzling to me now, online assignment help but in general, the usefulness and importance is overwhelming. Very much thanks again and best of luck! Just love the picture along with your story! I was born in the fifties and miss those days of visiting family and friends in our homes. Seemed like every weekend was a party...and we dressed like it too. The cooking never ended but Ma and Nani did it effortlessly and with joy. We grew up with all our cousins as our closest companions and still are close until this day. We can only hope the next generation does not lose this treasure! Join in and write your own page! It's easy to do. How? Simply click here to return to "Italian American Ancestry".